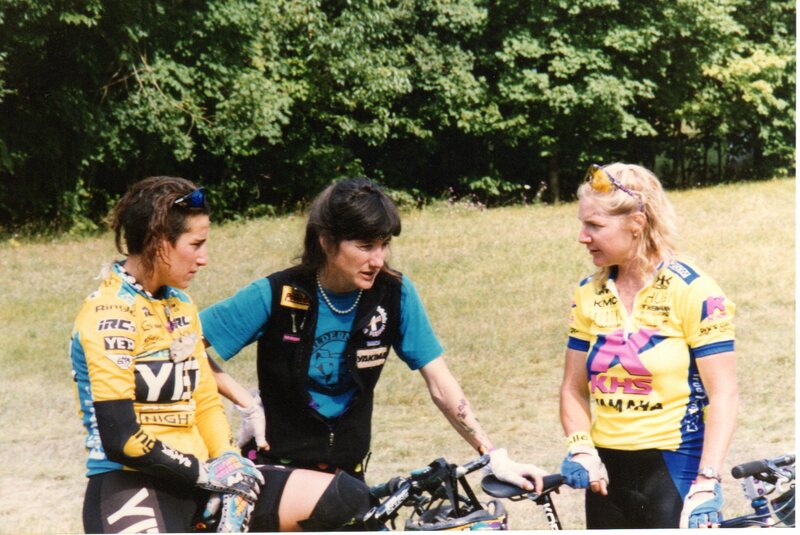 Tim Woolard snapped this in 1990, at Shuss Mtn, Michigan. Missy, me, and Cindy W.
Missy’s mom called Nicole Hahn to tell her Missy’s out on 5 yr probation. Her time served for that marijuana trafficking offense was proabably about two years at some Montana facility. By the way, Hahn’s the videographer who took up downhill racing to better understand the subject of her documentary, Hardihood. It’s a good one, starring Missy, Marla, Lisa Sher, and a handful of others, including me. The movie might get a second life, watch this space. ~ by jacquiephelan on November 28, 2011. I’m glad to hear she’s back on the outside. Hope she keeps herself out of trouble – or at least legal trouble, not the fun kind. Thanks for the heads up. Glad to know her life is looking up! Great news for sure! I have always respected her for what she has done for the sport, and more so, for her fellow humans. Don´t know what that´s worth, but I wish her all the best!